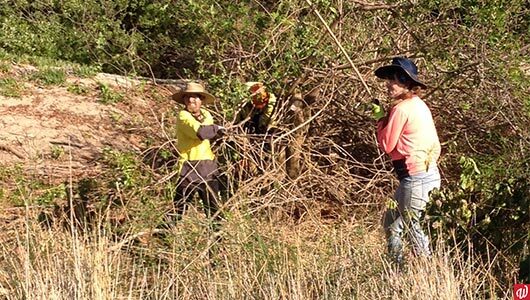 A weed removal project on another level: the Environmental team clear out thousands of Brazilian peppercorn trees from the coastal region of Tim’s Thicket. Environmental Manager Alex Growden, left, and Nathan on the right. We secured this unique project from one of our employees from Property Services, Nathan. He volunteers with the Bouvard Coastal Care Group (BCCG), who maintain the coastal dunes of the Mandurah city area. This vast space has a diverse and fragile ecosystem that needs to be protected. The area of Tim’s Thicket was covered with a large amount of Brazilian peppercorn trees. This species is especially destructive in coastal areas – if left unchecked, it invades the nearby areas and destroys native plant life. And while our Environmental team have completed many weed removal projects over the years, we’ve never taken on a project of this scale. Nevertheless, we accepted the challenge! A map of Tim’s Thicket with the estimated infested area in red. The infested area turned out to be larger than anyone anticipated. The weeds had also grown in a dense formation which made complete removal difficult. We had to ensure that all stems were cleared, as they could drop seeds and reinfect the area. But despite the difficult conditions, our team worked hard to remove all traces of weed by the end of May. 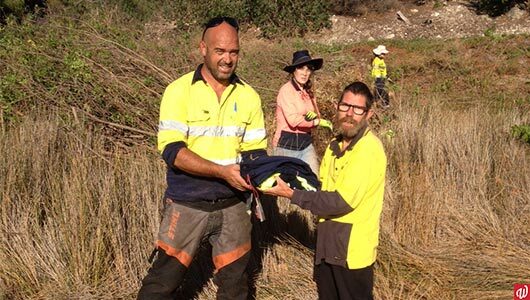 We then worked with local Mandurah company, Arboreal Tree Care, to correctly dispose of the plant material. The BCCG were very grateful to us for taking on such a tremendous project. And a big well done to the Environmental and Property team for all their hard work and persistence! Our team of specialists have the experience you need for any environmental project. Contact Alex today for a free quote here or at (08) 9375 4950.